In 1922, R. B. Slatter walked 1,800 miles from Vancouver, BC to Alaska and back to Atlin, BC in a pair of Russell Ike Walton boots made on a Munson Army Last, covering the distance in 153 consecutive days. As you can see, the front of the Munson Army Last, #1, provides more room in the toe area than other shoe lasts do. Last #2 is a boot last widely used to make men’s and women’s boots, Last #3 is a last used in making men’s and women’s oxfords and chukka style shoes. The #4 last is a narrower shaped, (some say more “stylish”), last used in making loafers. While each has its application, the roomier Munson Army Last, #1, provides a non-restrictive environment for the foot to do its work. By design, shoes and boots made on the Munson Army Last snug up the arch and heel when the shoe or boot is laced up, providing a totally different feel than other shoes. Why a Munson Army Last? The Munson Army Last has been around since 1912. -Named after its inventor, Edward Luman Munson, A.M., -M.D., Lt. Col. Medial Corps, United States Army, the Munson Army Last was adopted by the U.S. Army to enhance the fit and comfort of military boots issued to soldiers. The Munson Army Last was and is one of the few lasts that ever approached normal feet shape and contour. 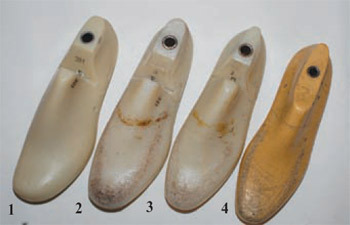 In 1912, Dr. Munson wrote, “The construction of shoes for civilians is influenced almost wholly by considerations of fashion and style...the lasts are devised by persons grossly ignorant of, and quite indifferent to, the structure of the human foot and its physiological requirements as a covering.” He went on to say, “The perfect, undeformed foot is found only in children and among savage, non-shoe wearing peoples.” His book, THE SOLDIERS FOOT AND THE MILITARY SHOE, is available on line at http://www.archive.org/stream/soldiersfootmili00munsrich_djvu.txt. Years ago Russell used to make boots and shoes over the Munson Army Last, but then, like most shoe makers, got away from it as styles dictated narrower, skinny looking boots and shoes. Having revisited the Munson Army Last when designing our special Thula Thula “PH” boot, we are now more convinced than ever that Munson had the right idea as this unique last provides more room in the toe area which translates to greater comfort, better balance and more power to the ground with less physical effort. Professional Hunter, Ivan Carter, who walks 2,000 miles a year and well known outdoorsman, author and writer, Craig Boddington, who spends half of the year on safari, report that the Munson-based Thula Thula “PH”, is the most comfortable boot they have ever worn. Recent tests have proven that runners can run faster, improve balance, coordination and foot strength by working out barefoot. For most people going “barefoot” on a daily basis is not practical. The Munson Army Last allows the same freedom of movement and encourages a heel to toe walking process and is adaptable to most Russell styles except loafers and 5 eyelet oxgfords. In 1948 Earl Shaffer wearing one of our Birdshooter styles made on the Munson last was the first person to hike the Appalachian Trail in one continuous hike.